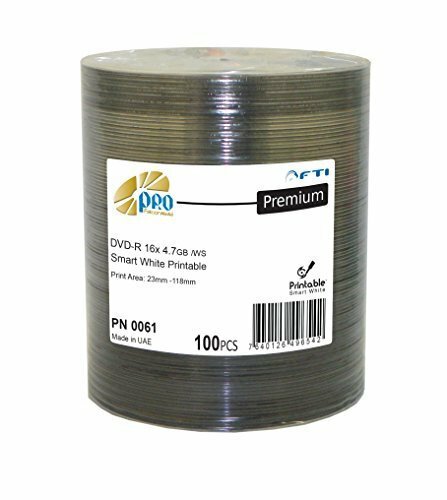 Falcon 16x Smart White Inkjet Hub Printable DVD-Rs feature a full coverage SmarkWhite inkjet printable surface layer that allows for drying times that are 20% faster than a normal inkjet surface. In addition to faster drying times, the SmartWhite layer allows you to use up to 20% less ink without noticeably affecting the printing quality. With these discs you can get clear, crisp, photo-quality on-disc printing more efficiently. These DVD-Rs meet the highest industry standards for reliability and compatibility, ensuring consistent quality when used in automated duplication systems. Each disc holds up to 4.7GB of memory and supports write speeds of up to 16x, making them excellent for both professional and home use. If you have any questions about this product by Disc Makers, contact us by completing and submitting the form below. If you are looking for a specif part number, please include it with your message.